Is there a place to purchase a physical copy? Not currently, but I’ll likely upload a print version to the RPGnow options after I put together another adventure. Thanks! Be sure to let me know anything awful/hilarious that happens. 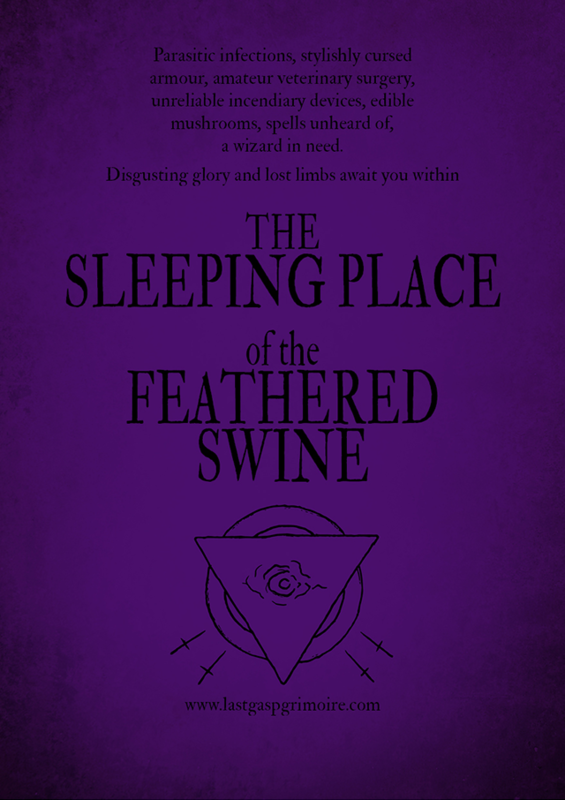 I had the chance to DM a oneshot with LotFP and chose this awful thing as adventure. It was my second time DMing, so I’m very new to this. It was an onlinesession with roll20 and voip. The beautiful map was neat and the players could feel lucky, they did’t have to map themselves :) . We met Felix with 5 level 1-dudes. I really liked the format, with the highlighted sensual perceptions for the different caverns. I think it really helped with the descriptions. We played in german, so I had to translate all your crazy words per dictionary, but I learned a lot! I think the right mood was set. Got some compliments for that. Somehow the worm tumours rolled badly, so only one arm and one leg had to be amputated. My players really liked the blackfire bombs, luckily the bombs did’t share that affection. One player lost two characters by self-inflicted inferno. Also, the hiding Aspeth was met whis caution and her cave entrance blocked with stones without conversing (ALL other opportunities to crawl and fall to nice places where taken, obviously… yeah even the crawl tunnels with hiding tumour… I generously allowed a grappling throw with that one). So, no injections for the swine and no cysts to sell. In the end they chose to flame up that poor soul (together with that one burned character). Also, the cave with the mushrooms and the armor was not explored, what a pity. I really hope we can continue sometime with these characters, so the magic-user can use some of the new spells, and perhaps something will happen with the cave pearl. Oh damn… two tumours are still crawling in there, so there’ something else to happen still ;) . Thanks for that adventure, really liked it! Hey, thanks heaps for taking the time to comment (it’s definitely appreciated), and thanks for not only running the adventure but for taking the time to translate the descriptions into German! I’m really glad you enjoyed it, and I AM working my way towards rebooting this blog, hopefully with another adventure in the same format to come not long after.